Hari Raya is in 2 days and I’m sure most of you are looking forward to wearing your new Kebaya, Kaftans or Baju Kurung. 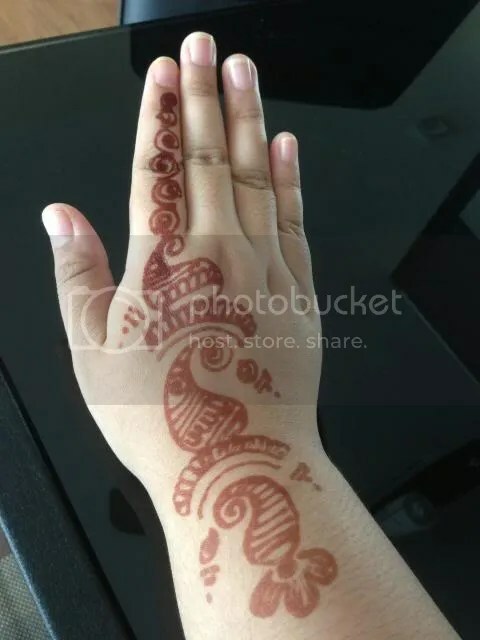 Other than clothings, hair and make up, during Hari Raya, some people decorate their hands with Henna. Last Saturday, I finally went to Geylang to check out the stuff there. I had one thing in mind which is to do henna. There are quite a number of Henna stalls at the Bazaar Ramadhan in Geylang. I finally found a stall which provides good service and affordable price unlike the other stalls. Most of the stalls charged $10 to $15 for one hand. I wouldn’t spend so much on it because after a week or two it will be gone. I rather spend the money on other stuff. Located in front of Joo Chiat Complex, this small stall, not only provide fast service but their henna artistes are so friendly. It was handled by a mother and her young daughter. I could not decide on a design because everything is just so nice. I told her I wanted something simple and nice. She explained that for simple design on one of the fingers and the rest of the hand will cost $5 while if I want to decorate all five fingers, it will cost $10. Since I wanted something simple and nice, I opted for the $5 package. It took her less than 10 minutes. Since I opted for the affordable option, I had to walk with my hand covered with henna. 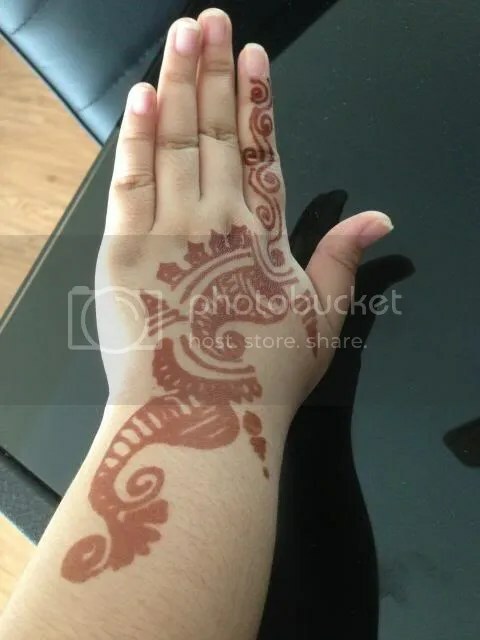 Other stalls provide a henna package where you do not need to wait for the henna to dry and you can wash it off immediately however, it is more expensive, $15 on one side of the hand. This is the after effect after I washed it. Both design is different on each hand because the lady said that if both hands have the same design, it will be boring. If you are interested to know the exact location of the stall, leave a comment on this post and I’ll give you a detailed description. You can also just buy the henna and design it at the comfort of your home. To all our Muslim readers, The Fifth Parlour would like to wish you a very Selamat Hari Raya Aidilfitri!